Hi beautiful! 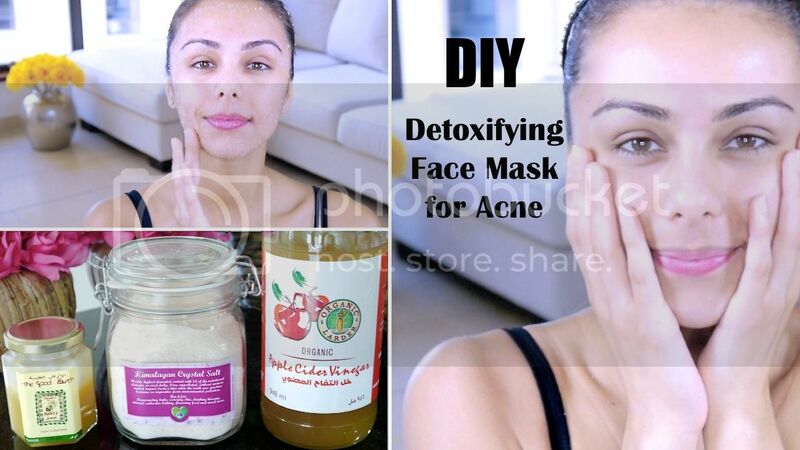 I have a new video up for you on this DIY detoxifying face mask which is great for helping to eliminate acne blemishes, skin discolorations and scarring. This has rapidly become one of my favorite face masks because of the super powerful ingredients. I have a summary of the benefits of each ingredient below. They are packed with goodness for your skin! I like to do this face mask / scrub twice a week (usually before hopping in the shower), and I love the way it makes my skin feel. I recently broke out pretty bad (due to the stress of moving etc), and these ingredients have helped speed up the process of my skin's recovery. As mentioned, I've started using Apple Cider Vinegar (diluted in water) as a face toner and as a hair conditioner / hair rinse and I LOVE it ♥ So happy I discovered this! I will make a video on it soon :) I've also been adding Himalayan Crystal Salt to my water, and it's very energizing and detoxifying (many people use this as a coffee replacement!). Zinc - aids in healing of the tissues and helps prevent scarring. It helps prevent acne by regulating the activity of oil glands. Zinc also promotes a healthy immune system and the healing of wounds. Sulfur - keeps skin clear and smooth. Dry scalps, rashes, eczema and acne are often due to deficiencies of this mineral. I sometimes simply apply honey on it's own to my entire face - usually before getting in the shower, and it's a quick pick-me-up for your skin! ok i just wana say am a huge fan of ur beauty blog!! I just love everything about it! am happy u moved to dubai! :D the thing is I live in saudi and most of the products u mention I cant get them from here but now your in dubai am hoping you'll be suggesting products that ill be able to buy! Yes I use apple cider vinegar I even post about it under How I maintain a well balance skin with home products that was one of the products any way I never use it as a hair rinse will give it a try. Where can I find that salt very interesting never heard of it thank you for sharing by the way I love homemade mask and scrubs this it such a great post and video. I tried honey as a mask and I loved it :) And also once I tried apple cider vinegar as a hair rinse and it was good too. :) You should try aloe vera! Lovely! i just bought a giant tub of honey for my skin. i have combo skin which is currently dry cause of winter but still acne prone. i use a DIY moisturizing mask with lemon juice, honey and oatmeal! it works wonders on my skin! Great video, i will try it for sure!!! Saw this on your youtube channel! I love how simple and few ingredients this mask involves, definitely trying this! Where did you get this brand of Himalayan crystal salt? I can't locate their website anywhere. I have used honey and apple cider vinegar before. I have used ordinary sea salt when I take bath because it gives me good exfoliation. Raw honey often gives me uncomfortable sensation so I usually use the commercial honey. I stopped using apple cider vinegar because it is too strong for me. Maybe I will try Himalayan salt. That's really amazing thanks for your tips i like it . . . .
you can contact us for face lift please visit your site . . . .